I guess Galaxy on 38th St. between 7th and 8th Ave. in Manhattan’s Garment Center doesn’t need the designer’s buttonhole business anymore. I was in despair until I found Jonathan’s on the same side of the street closer to 8th Ave.
Ostensibly an embroidery business at a storefront level, they do a land office business making buttonholes. I’ve seen people lined up with everything from duvet covers to fine men’s suits. You can see a lot of different designer lines coming thru here, as many sample studios do not have industrial buttonhole machines. To avoid that ‘loving hands at home’ look, a professional buttonhole is necessary. It’s hard to find a Reece style buttonhole anywhere anymore. Stand in line, pick your thread color, and wait. Or if you have a big bag o’ stuff, drop it off and come back in 30 minutes. Great service, and when you need it, you really need it. Those of you who live in proximity to New York City will appreciate this service – get your buttonholes done, and shop the Garment Center for fabric while you wait. Did I mention that Spandex House is almost directly across the street? See their website www.jonathanembroidery.com . I was able to get heatset rhinestones added to an embroidery done in China, when my supplier forgot to put them on the sample. Thanks to Sunny at Jonathan’s I was able to look like a hero! I want to insert a little aside here. 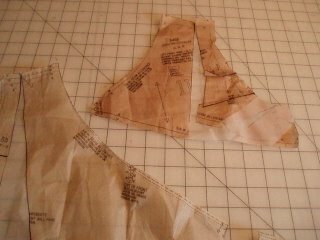 I never used to even give New Look patterns a glance, but they have some great basics that are very well drafted and very easy to sew. They include all sizes in one pattern, and they are bargain priced compared with the big 3. (end of shameless plug, and aside from being friends with Kashi, NAYY). I laid the Left Front piece over the left side of the Right Front piece (still with me? 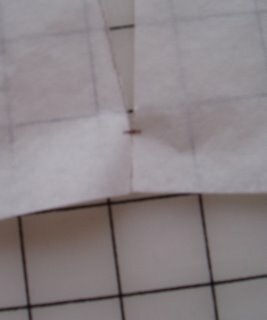 ), overlapping at the seamlines, and I taped them together with the sticky end of a Post-it note to hold them in place temporarily. Then I folded along the Center Front line so the left shoulder was lying directly over the right shoulder, and I traced my markings for where to slash the pattern. I unfolded, removed the Post-it notes and slashed the pattern pieces. You can see the results in the pictures above. It took a couple of minutes of extra time, but the results are worth it. And face it folks, if you’re sewing for yourself, let your inner Diva loose and remind yourself that you are worth every bit of effort! It’s even more subtle against my skin, which isn’t striped (usually). You can’t see it in the photographs, but the double layer of mesh also causes cool moire patterns whenever I move. To make this work, I serged all the seams, then topstitched with a narrow (1mm) zigzag stitch. I didn’t bother to finish the bottom edges. 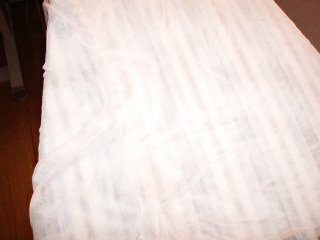 None of the RTW I have seen uses finishing on the hems of mesh tops, and only a few mesh bottoms have hem finishes, and those are all narrow rolled hems done on a serger. 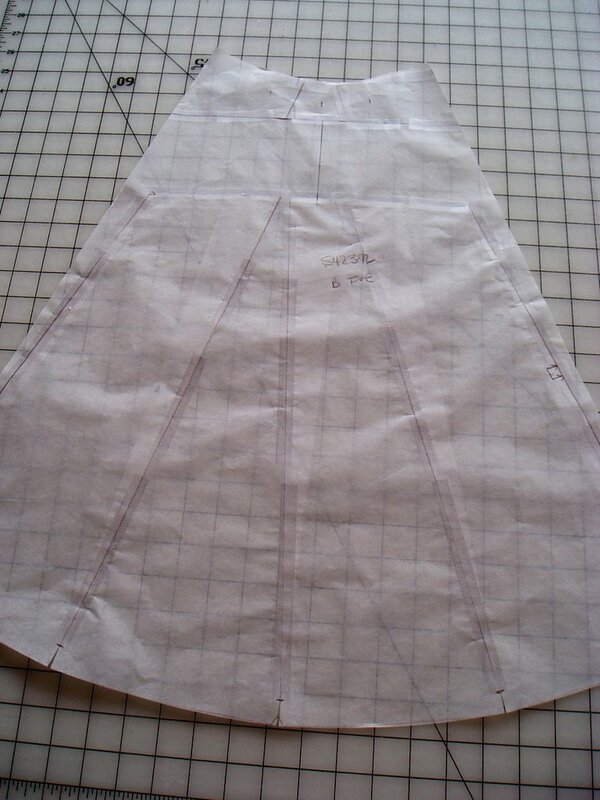 Before I cut out my skirt I checked the finished length on the pattern envelope – 21″. Perfect, or so I thought. 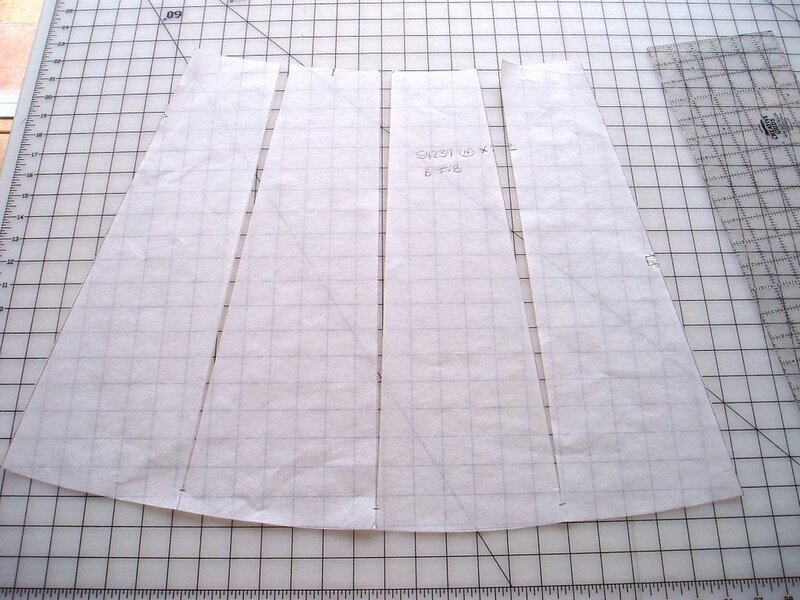 Don’t be misled – the finished length is 21″ from the top of the fold-over waistband to the hem. 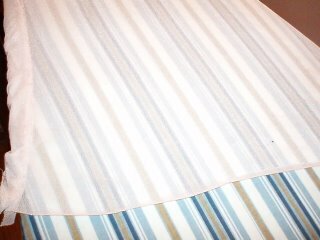 But, once the waistband is folded over the actual length is about 18″. Just a wee bit too short for me! However, I was happy with the way the skirt fit so I simply added 3.5″ of length just below the hip (don’t forget to lengthen the lining as well). If you simply add on at the hem you will increase the circumference and, therefore, the bubble-factor. I wanted just a touch of bubble on a slim skirt so this worked out perfectly. I chose a rayon/lycra jersey from Lucy’s Fabrics for the final skirt. I was a bit short on fabric and am not at all happy with the accidental almost-match of the waistband. 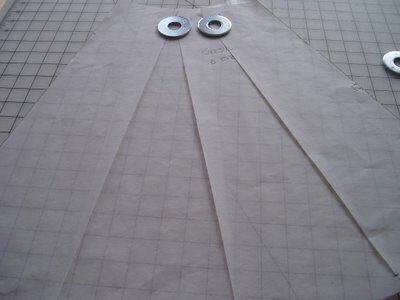 However, I’ll be wearing a wrap blouse with it so that part will be covered anyway. 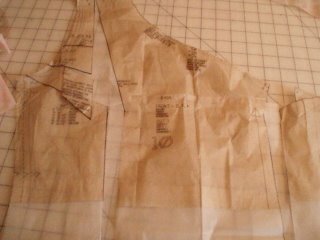 Notice that I also eliminated the fold-over cuff on the waistband. 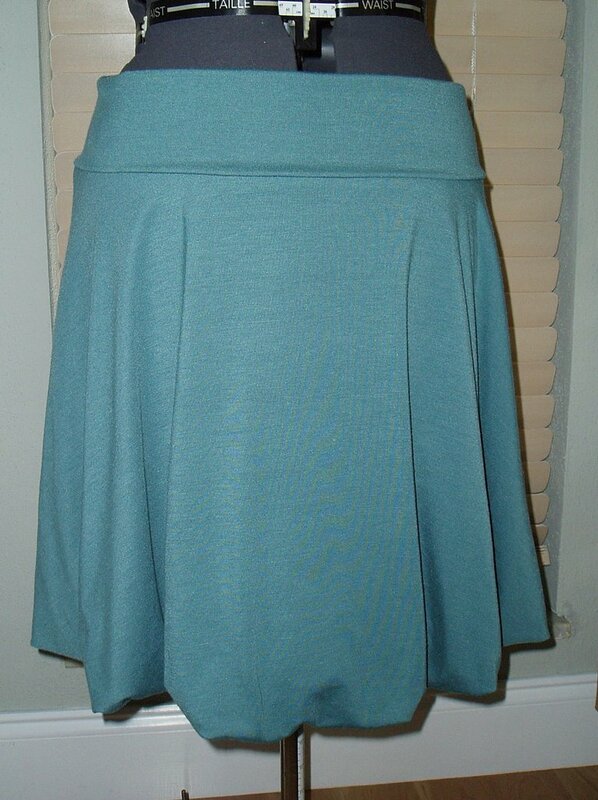 I used a slippery nylon/lycra stretch lining from Emma One Sock to line the skirt and underline the waistband. The waistband does not call for lining but my jersey was rather thin and drapey so this beefed it up a bit. to, but not through, the seamline at the hem. 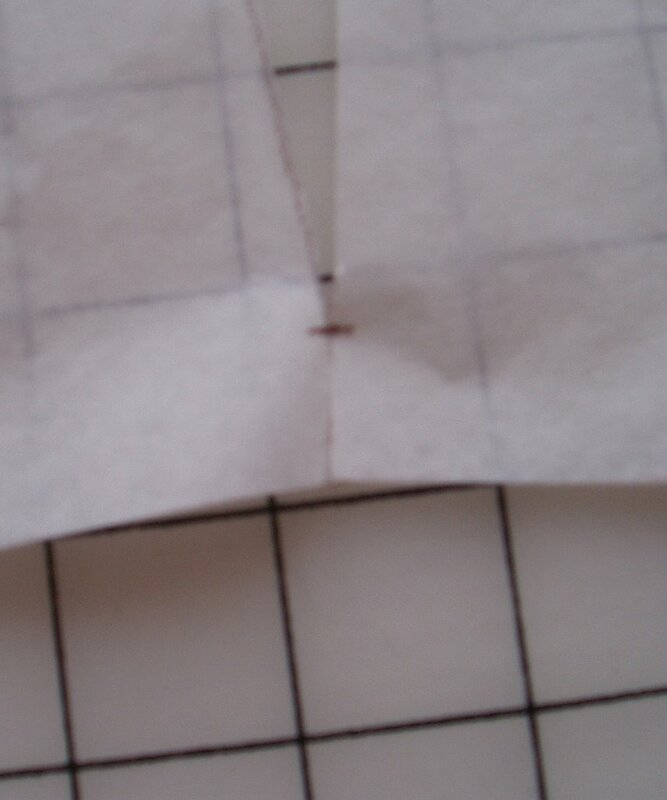 I then snipped from the cutting line to the hem marking to make a small paper hinge. If you slash all the way through you will, of course, shorten the seamline – which you don’t want. 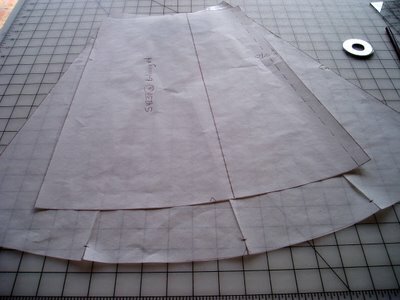 After comparing the skirt pattern to the lining pattern I knew I needed to remove 6″ at the waistband seam. 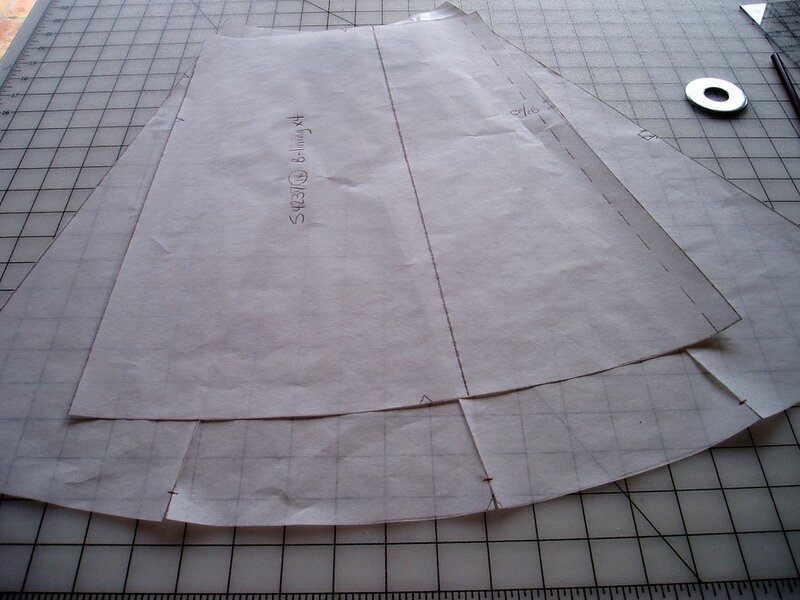 Since this piece represents 1/4th of the garment, I’ll be removing 24″ at the seamline – a lot of gathers! This meant overlapping each slash 2″. 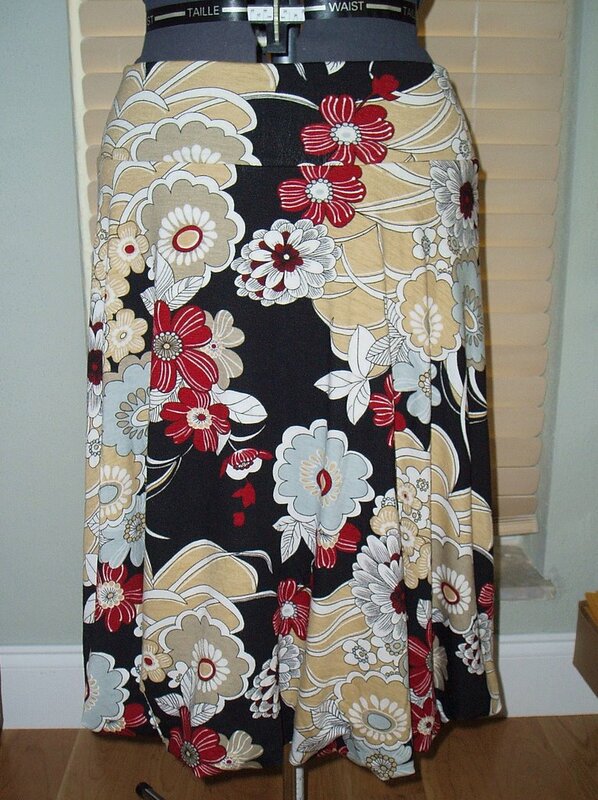 Here you can see that the skirt and lining match up at the waistband seam. The skirt is then gathered at the bottom to match the lining. The shorter lining causes the bubbling. Quilts like this one have such depth of meaning, and it’s wonderful to hear about pieces like this that will be with us throughout our lives. Thanks for this, Danielle!